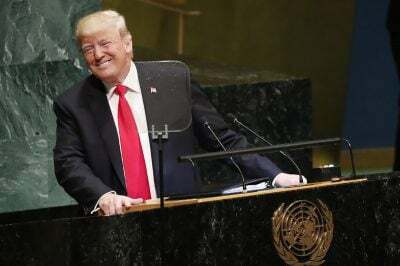 HomeFreedomDid Donald Trump Kill the Liberal-Globalist “New World Order” at the UN? The so-called “New World Order” of American-led unipolar globalism is dead after “The Kraken” delivered a scathing attack against all aspects of the Liberal-Globalist system that America itself previously pioneered, which he’s proudly seeking to replace with a nationalist-oriented model of International Relations that cleverly attempts to co-opt multipolar processes in order to most effectively thwart China’s Silk Road-assisted rise. The “New World Order” is dead, and Trump killed it. The pre-2016 worldwide power structure of American-led unipolar globalism was already fraying at the seams with the rise of China, Russia, Iran, and other multipolar Great Powers, but it could have nevertheless evolved to incorporate all of them within the prevailing Liberal-Globalist system as long as the US was willing to continuing sacrificing its own sovereignty to do so in becoming the “first among equals” prior to its eventual “dethroning”. That was the approach that Obama and his predecessors were applying in leveraging a combination of divide-and-rule policies to weaken America’s rivals alongside carrying out nifty outreaches to co-opt them into what it hoped could indefinitely remain a primarily US-influenced system, but Trump has done away with any pretenses of “equality” and is unabashed in his pursuit of unparalleled American hegemony across the world. The ultra-concise summary of the above is that Trump is deliberately behaving as chaotically as possible in his quest to destroy everything that he inherited so as to provide the US with the greatest possible opportunity to shape the new global system that will arise out of the ashes of the old one. The primary motivation for doing so is that the US gradually lost its previous monopoly over the Liberal-Globalist processes that it relied upon to control the international system after the Old Cold War, with the unofficial beginning of the New Cold War in 2014 and its resultant developments making this obvious beyond any doubt. China, more so than any of the US’ other rivals, managed to obtain an “uncomfortable” amount of influence over the world system, especially after unveiling its One Belt One Road (OBOR) global vision of New Silk Road connectivity that would inevitably lead to it replacing the US as the worldwide hegemon (albeit in what it purports will be a more equal international order) if left unobstructed. The US’ many Hybrid Wars were thus far insufficient in thwarting China’s Silk Road-assisted rise, which is why Trump decided to go for the “nuclear option” of trying to radically change the course of International Relations from Liberal-Globalism back to its erstwhile model of Nationalism. China can only succeed with the Silk Road so long as the processes of American-initiated Liberal-Globalism continue unabated, as it’s impossible for it to achieve its goals without free trade, a UN-centric rules-based system, and the progressive surrendering of US state sovereignty to the so-called “international community”, all of which are opposed by Trump. Thus, the Thucydides Trap that’s been often discussed in academic circles as supposedly being in effect between a hegemonic US and a rising China is actually reversed since the US has ceded its control over the previous hegemonic system to China and is now behaving as the upstart power trying to undermine the existing state of affairs. The US is therefore functioning as a “revolutionary state” in many – but, importantly, not all – ways, and everything that Trump spoke about in his UN speech should be seen as describing his country’s alternative model to what is now the Chinese-led Liberal-Globalist order. With that in mind, it’s possible to identify some of its main characteristics. Trump has a burning hatred for the Liberal-Globalist order and sincerely believes that it infringes on every country’s sovereignty, thus restricting its citizens’ freedom to prosper and undermining their personal liberties. In the Trump World Order, the UN either remains the practically useless talking club that it already is or is turned into a more effective instrument of American power after others submit to its authority and “allow” the “benevolent hegemon” to shape the world as it sees fit. The latter scenario isn’t going to happen without Russia, China, Iran, and even the EU resisting as much as realistically possible within their individual limits, which is why Trump is essentially encouraging the small- and medium-sized countries that function as objects of competition between them and other Great Powers to break ranks with everyone else and “go it their own way” while following America’s lead. Trump is counting on the de-facto “defection” of those states to pave the way for its Liberal-Globalist “Lead From Behind” Great Power proxies to join the Trump World Order as well prior to commencing the UN’s much-needed reform, which is a seemingly impossible feat to pull off but could nevertheless potentially succeed through the US’ weaponization of “Economic Nationalism” that will be described in a moment. Simply put, the US is basically trying to rewrite the “rules-based” order so that national interests aren’t as obviously subordinated to supranational ones like they’re presently becoming, even if the rest of the world ends up being compelled to settle for less by surrendering some of their own sovereignty to America in order to receive the “least-bad” outcome from this “New Deal”. Correspondingly, Trump sees the UN’s radical reform as an eventual step towards “stabilizing” this new US-led nation-centric arrangement. Trump’s speech drew a lot of attention to the unbalanced trade deals between the US and its many partners across the world, with the American leader arguing that everyone else is ripping his country off in order to profit at its workers’ expense. He’s previously accused corrupt politicians of continuing these outdated arrangements after the Old Cold War in order to satisfy their short-term self-interests despite these deals being completely disadvantageous to the US’ own long-term national ones. The US never used to mind “subsidizing” its “vassals” so long as this contributed to them reinvesting their profits in socio-economic programs designed to keep communism at bay, but the end of the Old Cold War changed that strategic paradigm, as did the EU and other countries’ incremental adoption of some core socialist principles. As such, Trump is opposed both in principle and strategy to continuing what he views as a Liberal-Globalist subsidization scheme for transferring American wealth to the rest of the world. Glenn Diesen, a member of Russia’s prestigious Valdai Club think tank and networking platform, published a comprehensive report at the end of last year about “The Global Resurgence Of Economic Nationalism” that does an excellent job explaining why the US decided to make the switch from Liberal-Globalism to this “classic” economic model and is a must-read for anyone seeking to understand this “flip-flop” dynamic. In short, as was mentioned earlier in this analysis, the US no longer believes that the old rules that it at one time directly created still advance its interests after its competitors succeeded in gradually turning this very same system against it, hence the need to “reset” the state of affairs in the hope of powerfully shaping the resultant outcome that arises out of the chaotic aftermath that “The Kraken” catalyzed. The so-called “trade war” is the structural weaponization of “Economic Nationalism” and Trump’s battering ram for destroying the “New World Order” that his predecessors perpetuated. The US knows that its “vassals” are slowly but surely being wooed by its rivals, especially China and Russia, even though Washington has been subsidizing their economies and militaries for decades. This calls for drastic measures to prevent those countries from fully drifting out of its orbit, hence the weaponization of “Economic Nationalism” that’s exploiting their existing “complex interdependency” with the US while it still exists as a tool of American coercion. The US is leveraging its relationships with the EU, NATO, and the Gulf Kingdoms in order to get the first-mentioned to purchase its comparatively more expensive energy and the latter two to pay more for the so-called “security umbrella” that they’re led to believe “protects” them from Russia and Iran, respectively. Proverbially speaking, Trump is discontinuing the US’ previous policy of “providing free lunches” to its partners and is now trying to gain a tangible “return on investment” for the billions that it subsidized over the decades. It’s notable that the American President specifically praised India, Saudi Arabia, “Israel”, and Poland all in a row in his speech, which signals that they’re the US’ preferred “Lead From Behind” partners for managing regional affairs in the Trump World Order. These countries are such promising “vassals” for the US because they each aspire to become regional hegemons and already preside over their own integrational frameworks. India is expected to become the US’ most important strategic partner in the 21st century, and the “Asia-Africa Growth Corridor” that it jointly founded with Japan could one day compete with China’s Silk Road in the broader Afro-Bengal Ocean. As for Saudi Arabia and “Israel”, they manage what could be described as the GCC+ that also counts Jordan and Egypt as members, while Poland is the leader of the “Three Seas Initiative”. Altogether, the US is building a new system of alliances all across the Eurasian Rimland for “containing” China, Iran, and Russia respectively. Wrapping everything up, “The Kraken’s” UN speech can be read as a manifesto of the Trump World Order that the US is striving to build as an alternative to the Chinese-led Silk Road one that poses the greatest challenge thus far to America’s predominant position over global affairs. Instead of continuing to play by the rules that his predecessors established and which at one time were advantageous to America’s grand strategic interests, Trump is creating as much chaos as possible in order to destroy the world system that previous presidents built after China began to gradually take it over. The US’ hegemony would eventually decline with the passage of time if it didn’t radically reverse its decades-long stance and start rapidly replacing Liberal-Globalism with the “classic” nation-centric model, one which also at the very least superficially appeals to the ongoing multipolar processes of the day and is more than capable of co-opting “Rising Powers”. Gone are the days when the US used to support free trade, a UN-centric rules-based system, and the progressive surrendering of its sovereignty to the so-called “international community” because the world is now entering the era of the Trump World Order where America prioritizes fair and reciprocal trade, the unilateral advancement of its national interests, and the strengthening of its sovereignty, all of which collectively contribute to undermining the Chinese-led Silk World Order. It should be said, however, that the US’ standards will remain hypocritical because it still won’t tolerate others pursuing their own interests at its expense even though it’s doing the same at China’s and everyone else’s, but that just speaks to the fact that International Relations is approaching what could be described as Hyper-Realism because of the unregulated competition between all countries as they struggle to strike a “balance” between the American and Chinese global models. Interestingly enough, Russian Foreign Ministry spokeswoman Maria Zakharova seemingly endorsed two of the main tenets of the Trump World Order by writing on Facebook that “The two cross-cutting themes in Trump’s speech at the UN General Assembly are: the need to defend their own sovereignty and the lack of alternatives for defending national interests. It is worth noting that this is applicable not only to the US, but all the countries in the world.” She may have been trying to make a witty rhetorical point, but nonetheless there’s a lot of substance to her reaction because Russia does indeed defend its sovereignty and sees no alternative to advancing its national interests, which is proven by its Machiavellian “balancing” strategy all across Afro-Eurasia. That’s not to say that Russia will finally do what the US wants and begin “balancing” between it and China, but just that Moscow will still survive and thrive if Washington’s model happens to gain the upper hand over Beijing’s in the New Cold War.